Within 250 miles of Overland Park, KS. Two-Day Swim Camp! Sign up for one or SAVE by signing up for both sessions for your swimmer’s age group. This swim camp are all about training to race FAST in long course (even if you don’t train in a long course pool)! Participants at each session will focus on increasing distance per stroke and maximizing tempo to swim fast and efficiently throughout the long course season. On Saturday participants will work on butterfly and breaststroke. Then on Sunday, participants will work on freestyle and backstroke. Your clinician for this camp is Olympic gold medalist Nick Thoman. Nick is one of Fitter and Faster’s most experienced and requested clinicians. Olympian Brett Fraser will also be in the water leading each session with Nick! Scroll down for more details on the curriculum. Nick will lead four sessions for competitive swimmers, two for swimmers ages 8-11 and two for swimmers ages 12 & older. Sign up for one or save by signing up for both sessions. Often called the short axis strokes, butterfly and breaststroke have many common attributes in their technique. Both can be challenging strokes to master due to the importance of rhythm and timing. In long course, it is especially important to maintain a high and horizonatal body position throughout each lap. Working on these two strokes together can deepen a swimmer's understanding of the technique required to swim with more efficiency and speed this long course season! BUTTERFLY: Perfect the complexities of balancing power and fluid rhythm in one of the most dynamic athletic strokes. Elite butterfliers maintain forward momentum by setting an immediate high catch with a perfectly timed kick. They are committed to a breathing pattern, perfecting their distance per stroke, and maintaining a horizontal body position which will help swimmers race more efficiently in a long course pool. Nick will help your swimmer become committed to these same skills to create better habits every time they swim fly no matter the length of the pool! BREASTSTROKE: Your swimmer will begin with a strong understanding of the timing of the kick and pull and begin to utilize the same strategies world class breaststrokers use to minimize their footprint in the water. Participants will learn the skills of swimming in a horizontal plane, keeping the hips high throughout the entire cycle and utilizing a small but powerful kick while generating power forward with their recovery. Finding the proper stroke length and tempo for long course can be challenging, but Nick Thoman will help each swimmer find the right combination for them! Have you ever noticed how freestyle and backstroke utilize the same kick, body position, posture, rotation, and an early catch? There are many similarities between freestyle and backstroke and creating maximum distance per stroke allows swimmers to race faster and imporve their endurance in long course! 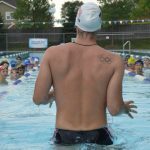 Your swimmer will learn drills and skills to be able to understand the WHY behind each movement as well as feel and apply techniques to build more power and race faster with Olympic gold medalist Nick Thoman. FREESTYLE: Participants will reinforce holding a straight and solid body line so that they can cut through the water with less drag which improves efficiency for long course. Practice keeping a still and low head position (especially during the breath!) while driving a strong flutter kick. Nick will also teach participants how to get an early and powerful press backwards on the water in the arm pull to get more out of every stroke. From the 50 to the mile, your swimmer will learn skills that will allow them to drop time in every long course freestyle race. BACKSTROKE: Engaging your core not only allows you to swim stronger, but it also allows you to hold the proper body position. Nick Thoman will help swimmers learn the importance of rotation and how to use it to their advantage for more power in each stroke to improve their speed in long course. The arm pull in backstroke should press the water all the way through using the whole arm to achieve maximum propulsion and length. Backstrokers are often the fastest kickers on their teams, find out why and learn to have a stronger kick! !